Last week, eccentric New York billionaire Donald Trump offered to donate $5,000,000 to President Barak Obama's favorite charity if the President would reveal his college transcripts and passport application by October 31st. Donald Trump believes that Obama's college transcripts and passport application will show that the President attended Columbia University as a foreign exchange student. In addition, Trump believes that the records will show that Obama was later able to enter Harvard Law School because of foreign aid and scholarships given to Obama, based upon Obama's applications that list him as a foreign student. Trump also believes that Obama's U.S. passport application will show that he applied for it as a foreigner. It can be debated whether or not Obama was born in a foreign country. What can be clearly proved is whether Obama ever applied for a U.S. passport or college financial aid as a foreign citizen. We live in a culture saturated with deceit. From Lance Armstrong to Bernie Madoff, America's greatest sports, business, and political heroes have lied in order to get ahead. Lying and deceit seems to have become the norm, so no one should be surprised if a man running for President is guilty of deceit. Though even the desire to deceive was once considered immoral in our culture, as generations have passed, Americans have become more tolerant. The cultural attitude has become, "Everybody cheats to win, and if you are not willing to cheat and then lie about it, you lose. Just don't get caught." What has caused this change in attitude? Maybe the act of deceit is like wormwood; a falling star poisons culture, and we have had way too many falling stars. The shocking thing to me about Trump's $5,000,000 challenge is the indifference that the American people have to the Rule of Law. People have mocked Donald Trump's hair, ridiculed the politics of his announcement, and paid little or no attention to the principle at stake. 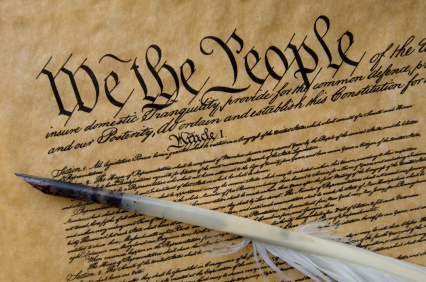 The Federal Constitution of the United States of America states in Article VI states that, “This Constitution … Shall be the supreme law of the land.” The Constitution also declares "that no person but a natural born Citizen" shall be America's President. That is the Rule of Law. When Arnold Schwarzenegger, a Republican, was considering a bid for the Presidency, Republican lawmakers considered either a Constitutional Amendment or Federal legislation to negate the Constitution's natural born citizen clause. It is the right for every American to seek to change the law through the legislative process. What destroys a Republic is allowing anyone, including a President, to deceive others in order to avoid the Rule of Law. Most Americans do not know if this is actually happening in Obama's case, but every American should care to find out--unless one's politics supercedes one's view of the Rule of Law. "This means that no person, however powerful or talented, can be allowed to act as if he were superior to the law of the land. Public decisions must be made upon the basis of law, and the laws must be general rules that everybody obeys, including those who make and enforce the law. A law that violates the Constitution is not a law and is not, therefore, enforced. This was the principle that Marshall followed in Marbury v. Madison." The problem we have in America is not another four years of Barak Obama. The problem we have in America is not even the polarization between Democrats and Republicans. The problem we have in America is that very few people care anymore about the Rule of Law. That marks the end of a once strong Republic. Our society doesn't 'mock' Donald Trump. He is what he is, rich and 'powerful' and he has 'a voice' in our country because of his wealth. So people are impressed by him, and they listen to his voice. "They would see folks like we met, folks like Billy, who's working part time because his job got cut back and has enough money to put a roof over his family's head or food on the table, so he chose a roof in order for his kids to not be homeless and stay in the same school system and now he uses food stamps to feed his folks, as well as going to St. Benedict's dining room in Milwaukee every evening to have a warm, good meal. You'd see folks like Tia, who's struggling really hard, having been a foster kid, learning how to raise her kids, get an education and become a nurse. You'd see folks like Shayesha(ph), who has really been able to get her GED, is now in college, is working towards her BA degree and is pulling her life together. I have a whole litany of people, but the other thing that I've realized is that, every place I have gone since the bus trip, I keep meeting people with similar stories who are struggling who you would never know because they're unseen." I think that in sacred Scripture, we are taught that God hears the cries of the poor. There is a morality in Christianity that calls us into solidarity with those who suffer among us, and if we choose to ignore their suffering, do we mock the One Who DOES hear their cries ? I wouldn't worry about unfairness to Donald Trump, Wade. He welcomes all publicity, and he manipulates by being openly obnoxious to gain even more publicity. It's time for at least some consideration of the silent voices among our people, those who struggle and mocked as 'lazy' by politicians. Thanks for the comment. I am no admirer of Donald Trump. The Rule of Law is the principle I am illustrating in this post, not the personalities in the soap opera of modern politics. I agree with you about advocating for the powerless. On my way to see the Sooners whip up on the Irish. Unable to respond to any comments. Your "rule of law" point is well taken and true. Too bad you chose to build your valid point around a huckster and showman like Trump. Can't you agree with me that Trump welcomes (and almost invites) the mockery? You confuse the issues. Mocking a publicity hound and celebrity like Trump is nothing like mocking the rule of law! As far as that goes, what does Obama's transcripts have to do with the "rule of law" anyway. Do you think that he was not vetted by the law long ago? When a journalist asked for Trumps transcripts he was rebuffed. How do I know that he is not a colossal fake? I am sure you can see where this kind of reasoning leads to craziness (and a waste of time). How far should this vetting go? I find it strange (and a bit disturbing) that no one is asking for Rommney's birth certificate or transcripts. Republicans just can't bring themselves to the truth that a black man with somewhat liberal views was LEGALLY running for the office and was LEGALLY voted in as President. Agree with him or not OUR President deserves more respect than this. I wish this is what you had written about in response to Trump's ridiculous "deal". As far as that goes - if you are a zillionaire - why not give the money to charity transcripts or no? Your words are very timely for our country: I could change a few words of what you wrote to apply to the current situation in Australia, "Lying and deceit seems to have become the norm, so no one should be surprised if a Prime Minister is guilty of deceit. Though even the desire to deceive was once considered immoral in our culture, as generations have passed, Australians have become more tolerant. The cultural attitude has become, "Everybody cheats to win, and if you are not willing to cheat and then lie about it, you lose. Just don't get caught." As I watch the goings on in our government, the cunning manipulation of situations, the spiteful attacks on personalities,the character assassination, the blatant, very public dishonesty, I can only be thankful that God is ultimately in control, even though our P.M. says she doesn't believe in Him. I am afraid this blog post is about 11 years too late. The fall started in 9/11. The failure to adhere to the rule of law was precipitated under George W. Bush, with the loss of Civil Liberties in the fight against "terrorism". And it worsened under Barack Obama. The wholesale shredding of the constitution. Now, the loss of Civil Liberties is complete. Another major error on Obama's reign was the looking away from wholesale breaking of the law of Civil Liberties under Bush regime and accommodating the banksters who precipitated the financial crash in 2007-2008. And then Obama went further in complete shredding of Civil Liberties. Now, you will never here this in the current campaign from either party. They both are complicit in this. History will judge both Bush and Obama administrations very harshly. Oh. By the way, Osama Bin Laden actually accomplished his goals. In their zeal to vanquish al-queda, both parties destroyed the constitution. This "terrorism" will be here for another 100 years. Meanwhile ALL Americans will feel the brunt of the militarized police state. Welcome to the future. You are already here. Thy Peace says it pretty well for me. Wade, the only thing I see that is "bad" about you using Donald Trump to make your point is that people get all hung up over Donald Trump. Me? Nah, I think the post is right on target. The rule of law in this country has been gone a lot longer than before George W. Bush. Whether it's from Trump or somebody else, someone needs to ask. Frankly, I can't believe Romney didn't when Obama was harping about Romney's tax returns. That would have been the first thing out of my mouth, "Bust out your college papers and I'll bust out my tax returns." Unless I had something to hide. Obama is a low-ball "Chicago Machine" politician, and I'm quite sure he has authored several college papers that prove he is a Marxist of the first order. But, we can't read them. It's not like we need to see them - his past is littered with Marxist associations from Ayers to the preacher he sat under for 20 years. Yet, some people must see written proof to wake up. As I said, Thy Peace has said it well for me. Yet, George Bush is gone. Obama is president. Should Romney win, I see no real victory. I seriously doubt one less baby will be aborted, or that the rule of law will be suddenly in fashion. No matter who wins, the American people will see change like never before over the next year. They are holding this thing together with string, duct tape, bailing wire, etc., until after the election. It is wonderful to have the peace that only Jesus Christ can bring. He is totally in control of all these events and holds us in His hands. To bring it back full circle, we have earned what's coming by our putting up with the destruction of the rule of law. Some folks will blame the Lord Jesus Christ, but let us use the time to draw closer to Him. I read some time ago that two of the unmistakable precursors of every civilization that has fallen from within are (A) the decline of law & order .. more specifically the decline of order, which is the lack of enforcement of the laws, and (B) the loss of national morality. The audacity of hope is really the impossibility of hope, lacking those two things. Tell me we're not there, now. "The problem we have in America is not another four years of Barak Obama. The problem we have in America is not even the polarization between Democrats and Republicans. The problem we have in America is that very few people care anymore about the Rule of Law." “The king is not saved by his great army”...nor by constitutions, nor by “law” in and of itself; though these are gifts. “Warriors” are not delivered by their great strength...though we are thankful for those who “bear the sword” and are sent to protect and commend those who “do what is good;” yet there will always be those who circumvent law, not living by “faith,” pisteuo, to entrust their well-being to God, but fear, even all the while deceived that they are doing what is “good.” And oh the cost! My husband said recently that his father told him...locks are to keep honest people honest. So the constitution. Merely seeking to control by enforcing law...is not the root issue. Your article was outstanding and spot on. It is the height of hypocrisy for this president to call on Mitt Romney to release his tax records when he himself will not release his college papers. Ridicule is employed to get people to shut up and that's what's been done about this issue. The sad truth is that most of President Obama's supporters couldn't care less if he was born here or not. Incidentally, being and old Hoosier by upbringing, I very much appreciate the gentle way your Sooners whipped up on the Irish yesterday. You said:"The sad truth is that most of President Obama's supporters couldn't care less if he was born here or not." I do not agree with your above statement. How would you prove it is true or not true? Are you saying you do not believe he is a US citizen? Will you vote for a Mormon? I base the idea that his supporters couldn't care less on the fact that they continually ridicule President Obama's detractors rather than simply asking President Obama to provide the transparency he promised. Secondly, quite frankly, I have no doubt he is a U.S. citizen I just don't know why he has kept his college papers sealed. And lastly, yes I am voting for a Mormon for president. And in reference to that, why the religious litmus text? Why should he release his college records? Obviously he does not have to and is not going to. You also said:" And in reference to that, why the religious litmus text?" I have always been told that Mormonism is a cult in my 38 years of Southern Baptist life and Southern Baptist pastors have preached against Mormonism from their pulpits to the people. But fast forward to 2012 and a Republican and also a Mormon is running for President and all of a sudden it is ok to vote for a Mormon as President. How do you explain this to your congregation? I really do not care who you vote for and should not have even asked you but from what I hear many SBC pastors will cast a ballot for Mitt Romney. Maybe the SBC will change other positions in the near future such as about Women pastors. smiling. You have every right to ask who someone is voting for and I don't mind saying. I agree that Mormonism is wrong and I preach against it. I equally believe that liberal christianity is wrong and I preach against it. As far as I am concerned there is no substantive difference between Mormonism and liberal christianity and therefore is a wash. Both present a false view of Christ. Also, I don't explain why voting for a Mormon is ok because I never endorse a candidate from the pulpit. It's not my place to tell people how to vote. If they ask me personally I tell them my reasons for my choice, but it would be an abuse of my office to do so from the pulpit. You have every right to ask who someone is voting for and I don't mind saying. I agree that Mormonism is wrong and I preach against it. I equally believe that liberal christianity is wrong and I preach against it. As far as I am concerned there is no substantive difference between Mormonism and liberal christianity and therefore is a wash. Both present a false view of Christ." John I am not following how you went from speaking about Mormonism to liberal christianity. I no where mentioned liberalism, why did you go there--I'm not following you. I know you didn't mention liberal christianity. There are two choices for president and I don't agree with either one's religious views. My point is this, Romney is Mormon, I don't like that, Obama is a liberal christian, I don't like that either. That's how I can justify voting for a Mormon because the alternative is voting for a liberal christian. To me that makes the whole religious question insofar as the candidates are concerned a wash. In other words, you asked me how I justify voting for a Mormon, my answer is that I currently have no alternative. I personally believe that Romney is more qualified to be president than President Obama is, so I'm voting for him. I am still trying to figure out what liberal christianity is but let's pass on that discussion. I believe your Post is one of your best! Sometimes a joke portrays truth better than facts because people remember something funny. John Wylie and Tom Parker, do you believe ANY Christian, liberal or otherwise, can believe Islam has a prophet? His speech was given two weeks after the murder of our Ambassador; Chris Stevens and others by Muslim terrorists while their plea for help fell on deaf ears of our government. Our government even had a drone reporting the six hour battle by volunteer Seals trying to save Stevens. 1. Examine the intelligence delivered to the Administration officials. 2. How it was reviewed. 3. Why inaccurate information was passed to the media and American people by the president and his surrogates. Thanks Rex for the question. No I don't believe that Islam has a true profit. And in regards to your Libya comments I personally think that the whole Libya fiasco will be President Obama's undoing in this election. “The future must not belong to those who slander the prophet of Islam”? I mean is that a polite way of saying ‘Death to the infidel’? I believe the news media has kept the Libya deal too hidden to influence the election, but when the truth is known I believe Libya will make Watergate look like a drop in a bucket that would lead to an impeachment if Obama is elected. You said:"I personally think that the whole Libya fiasco will be President Obama's undoing in this election." I know as SB we are not supposed to bet, but I will "bet" that you are incorrect in what you said above. NO CHRISTIAN believes Islam has a TRUE prophet! So that tells us what Obama is. Why didn’t Obama add killing our Ambassadors to his list? Many years ago, I had a cousin that served as Ambassador under four U.S. presidents. I believe if he was alive today, he would refuse to serve in a Muslim country seeing how Obama had all the time in the world to save Stevens, but he didn’t lift his little finger. John, how did you learn of the “Libya fiasco”? Was it an email or blog? I’ll be like Tom and say ‘I’ll bet you didn’t hear it on TV’. Truth needs no defense but it does need to be heard. When the News Media suppresses Truth, you have an ignorant Nation. Looking via statistics, it appears Obama will be elected to the 2nd term. The only things that might derail that is any vote miscounts or challenges of voters, which Republicans are mobilized to do. Glenn Greenwald > Who is the worst civil liberties president in US history? Wade, a great blog and some very engaging responses. Somehow, some way, our Republic will survive regardless of the outcome on Tuesday - as it has always been wont to do. There is a great danger conflating "Christianity" and "Evangelical" with a certain Party. This is a fatal connection - and will have dire consequences. And, is it any surprise that surveys show us that church attendance, identification as ones self as "Christian" going forward is on the decline (read the recent Pew Report)? Finally, are we electing a Bishop or Pastor or Commander-in-Chief? On the third anniversary of the Fort Hood shooting, 148 victims, family members sue the Government because it is avoiding legal and financial responsibility by referring to the shootings as "workplace violence" rather than a terrorist attack. Is Obama worried about saving taxpayers’ money or is he reluctant to sign a death penalty to a Muslim if he is found guilty of murder? Maybe where Ambassador Chris Stevens was murdered will be classified as“workplace violence” instead of a terrorist attack. PRESIDENT OBAMA addresses the U.N. General Assembly: 'The future must not belong to those who target Coptic Christians in Egypt – it must be claimed by those in Tahrir Square who chanted “Muslims, Christians, we are one.” The future must not belong to those who bully women – it must be shaped by girls who go to school, and those who stand for a world where our daughters can live their dreams just like our sons. The future must not belong to those corrupt few who steal a country’s resources – it must be won by the students and entrepreneurs; workers and business owners who seek a broader prosperity for all people. Those are the men and women that America stands with; theirs is the vision we will support. The future must not belong to those who slander the prophet of Islam. Yet to be credible, those who condemn that slander must also condemn the hate we see when the image of Jesus Christ is desecrated, churches are destroyed, or the Holocaust is denied." Let’s discuss your quotes from Obama. If Muslims and Christians are one, WHY is one going to hell and the other heaven? Does his apologizes to other countries for what he said America has done give a clue? Did bowing to a Muslim king indicate America will also bow? Do we honor a person disguised as a distinguish person? Jesus even slandered the clothes of the Pharisees. If Obama respects a false prophet then Obama is WRONG. BTW, Wade’s “The rise and fall of the United States” continues with Obama being elected again. What would you say of a nation that elects a lesbian to the Senate? You indicated America was electing a Commander-in-Chief. What would you think of a lifeguard that did nothing to save a person from drowning? What do you think of a Commander-in-Chief that did nothing to save his Ambassador from being murdered? You could truthfully reply that we don’t know the facts. Why doesn’t America know the facts instead of everything swept under the carpet? Will the closed-door Senate Intelligence Committee on November 15, 2012 find the facts? Will the public know what they find? Wade, I often appreciate your pastoral wisdom in this blog. Your political bias in this case, however, blinds you to the obvious: if a presidential candidate was not qualified to run, that person would never survive the opposition research machines of his or her primary opponents, much less the opposing party in the general election. Seriously, you must be drinking some Koolaid mixed by Wiley Drake at this point. Such assertions border on bearing false witness. You have no evidence to support the claim, yet you still post it. Repentance is the order of the day rather than the congratulations poured on by many of your readers. Worse yet are the disingenuous posters who try twist presidential gestures of reconciliation in the midst of interfaith social conflicts abroad into first order theological claims. Again, if not willful ignorance, such posts constitute false witness. I suspect you don't tolerate profanity in posts, why then tolerate false witness? Poor Wade; he gets it from all directions doesn’t he? Why don’t you direct your attack against the person you’re having conflict instead of dodging around through Wade? Your indicating if Obama was not qualified, his opposition would have proved otherwise, is the same as proving the Trojan Horse was accepted by 100% of the people or just the majority. I believe under the disguise of freedom, accepting the Trojan Horse of Islam will be the downfall of America and a Muslim in the White House is a good start. Steven, we have seen how Obama changed the terrorist attack at Fort Hood into “Workplace Violence” to avoid responsibility. HUH? Are you indicating the murder of Obama’s Ambassador Chris Stevens was “social conflicts abroad”? If so, I believe it’s you that’s drinking Kool-Aid, and it’s you that’s bearing false witness. Wade, I typically enjoy reading your posts, but you lost me on this one. You imply the President is lying. Why? I consider your reckless implication akin to a false accusation. The President has provided documentation of his birth. This issue has been rehashed so many times it is sickening. The problem with our nation is that people are not loving their neighbors as themselves. I would hope you, of all people, could see that. Please stop accusing people of things unless you have clear evidence. It is unbecoming of you. Would you take five million dollars to show your school records? “Some light will be shed on the agency's recent activity when the acting director of the CIA, Michael Morell, testifies next week before the Senate Intelligence Committee about the attack on the Benghazi consulate in September that killed four Americans, including the U.S. ambassador to Libya and two men who were recently revealed to be CIA employees. Wonder why General Petraeus ‘jumped ship’ (resigned) before having to testify? Does he not want to blow the whistle on someone? Does he think he can’t be called to testify by a subpoena?